I am Vivian Khisa from Seritanyi area and I live with my grandmother. Both my parents are gone due to HIV/AIDs leaving us orphans. I am a student at Siritanyi primary school part time in class two. My grandmother is very old and the type of work she is doing cannot support my needs both in school and at home. She is just doing casual works within the area. Un-like many children, there are days we go without food and most every day without breakfast I can’t even remember the last time I had breakfast. I need support to fulfill my dreams because of the challenges at home school is very hard for me. Without any support things don’t’ seem bright and I may never see my dreams fulfilled. When I finished my education, I want to be a judge to help people and support others with the same needs that I have now. In doing this, my hope is they can also support others as well to achieve their goals. I like reading, playing ball, singing as well as attending the church service. Please send me an introductory letter to letters@ccikids.org and I will be sure to write back to you. You can write to me as often as you wish and that way we will really develop a relationship. 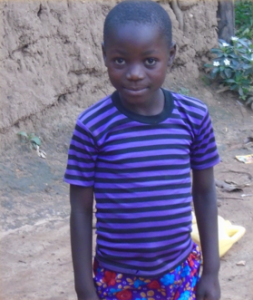 When you sponsor a child like Vivian Khisa you not only help this individual child but helping Vivian also helps his community. We are building a self-sufficient, eco-friendly Children’s Village. Part of your donation will go towards building schools and houses so that Vivian can have a brighter future. Here is how you can sponsor Vivian.